In Southern Kentucky near Tennessee! or if you would like to hire us to develop a page like this for you. The pictures below are some of the 150 mixed breed heifers we are pasturing this summer on our farm. These pictures were taken on August 2, 2002. We estimated on that day that the cattle weighed 550 to 650 pounds averaging about 600 pounds with a few weighing less than 550 pounds and some weighing over 700 pounds. These are good heifers that will be suitable for breeding this winter to calve as two year olds in the fall of 2003. 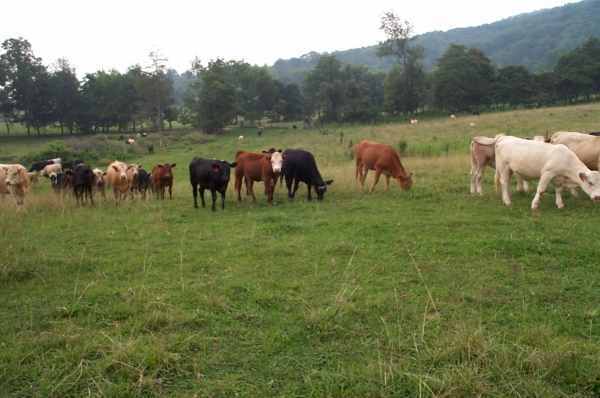 They are running on 150 acres of good grass and clover pastures with plentiful water from three creeks. We plan on pasturing these cattle until about Thanksgiving and then selling them. Although they probably were not worth that amount when the picture was taken we think that at some time between then and Thanksgiving they will be worth $83,000. We would be glad to sell them for that amount if any buyer decides that he needs 150 good heifers and is willing to give $83,000. In other words they will be sold for $83,000 to the first buyer willing to pay that amount before Thanksgiving. The day this picture was taken, November delivery feeder cattle futures as listed in the Louisville Courier-Journal newspaper were about $78.00. We expect to increase or reduce our $83,000 price as those cattle futures change. Also, in February 2003 we will be interested in buying 150 to 160 head of feeder cattle weighing 400 to 450 pounds on the farm in lots of at least 30 head. Anyone having such cattle for sale is asked to contact us. If interested in buying our cattle or selling us calves this winter please call us at (606) 387-5884 or email us at duane@kyphilom.com. 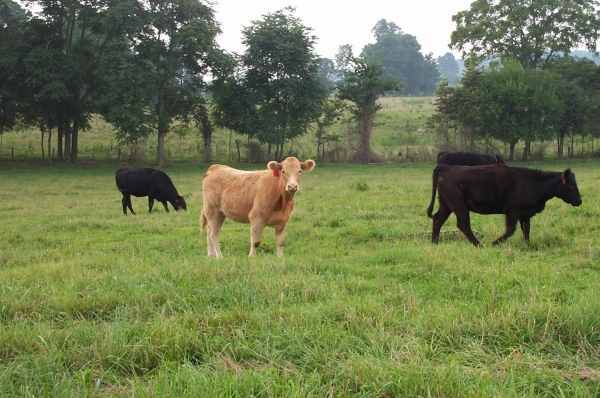 Cattle you purchase from us will be available for loading from our barn near Albany, Kentucky. A description of the farm and more farm pictures. A description of tobacco in Kentucky and more farm pictures. All contents copyright (C) 2002, Duane Bristow. All rights reserved.